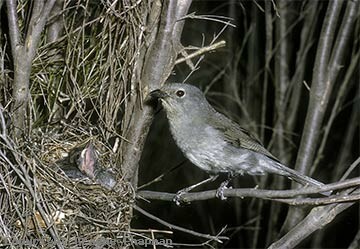 Generally regarded as an inhabitant of the mallee, Gilbert's Whistler occurs also in a wide variety of shrublands throughout inland southern Australia from about Eugowra, NSW, right across to the west coast of W.A. Throughout this range, some variations in plumage occur which are not well understood or illustrated, but are fairly well described in HANZAB Vol 16 p.1092. 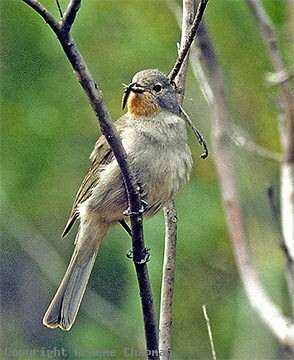 At one stage, two subspecies of Gilbert's Whistler were recognised, basically western and eastern. Males from W.A. and as far east as the Flinders Ranges display varying amounts of buff colouring on the underparts (see pic 403204D for an extreme example). 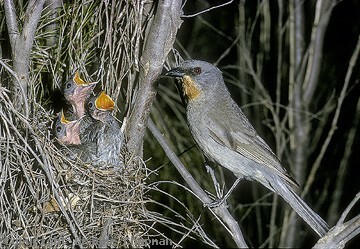 In eastern Australia, most males are like the one in pic 403201, where apart from the throat, the underparts are all grey, fading to whitish on the lower belly. Females are simply plain grey all over. However, the emphasis is on "most males". There are lots of exceptions. Pic 403204D was taken at Nombinnie NSW (N of Hillston) and there are many other pictures on the internet of males photographed in eastern Australia that show varying amounts of buff colouration ventrally; these birds could easily be mistaken for the rarer Red-lored Whistler. The key field mark is the black lore of a male. According to HANZAB, adult plumage is not acquired until the third year, but these variations in colour of the underparts don't seem to be age related. All this is discussed in detail on pp 437-438 of Scodde & Mason's "Directory of Australian Birds". It is generally accepted that adult Gilbert's Whistlers live as resident pairs in permanent territories . Given that young birds eventually need to wander further afield in search of a vacant territory, it seems unlikely that the odd individual from the west would make it all the way to eastern Australia. 403201 ... Gilbert's Whistler, male, Pulletop NSW. Most males in eastern Aust. have a grey belly. 403202 ... Gilbert's Whistler, adult female, Pulletop, NSW. 403203 ... An immature male from Western Australia carrying food, presumably nesting. Note the pale lores. 403204-D ... 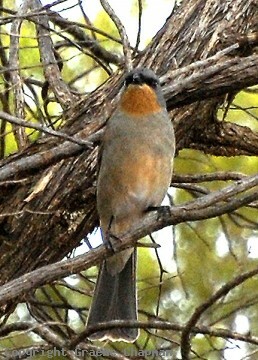 This brightly coloured male from Nombinnie NSW could be mistaken for a Red-lored Whistler.